An Post closing nearly 160 offices. Rural Ireland is up in arms over the destruction of the post office network, but shockingly the Fianna Fail leader Micky Martin has said the party isn’t willing to make an issue of the setback. Micky Martin, TD, Leader, Fianna Fail …party won’t make post office closures a red line issue. An Post is pulling some 159 offices from the countryside where already the economy of towns and villages has been systematically gutted under rural destroying government policies. 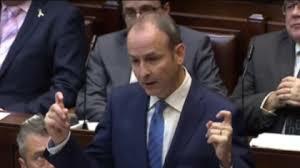 Now, the leader of the government backing Fianna Failers says his party will not be making the mass closure of the post offices a red line issue in negotiations on the budget. In an interview with Shannonside FM, Martin said, as an excuse for his party’s inaction on the post office closures, that it was more responsible to come up with solutions rather than threatening to bring down the government. Martin did not explain why raising the closure of rural post offices would cause the government to collapse. Announcing what the party’s priority is to be, he said it intends to make a very serious challenge to win back a seat they lost in Longford-Westmeath. No doubt many will question the wisdom of supporting a party that, like the government it is backing, doesn’t appear to have much time for rural Ireland as it battles to survive. In Sligo, there are hints that Eir may decide to locate a call centre in the town. Aside from this, there’s at the moment little more about jobs on the horizon. The area has a population of four TDs – MacSharry and Scanlon, Fianna Fail; McLoughlin, Fine Gael and Kenny, Sinn Fein. They all have been on holidays from the Dail for the last few months.